Hr Ebony Princess smashed the Prairie Meadows 400 yard track record while winning the Iowa Double Gold Derby on Sunday. ALTOONA, IA�SEPETMEBER 1, 2013�Bobby and Vickie Hammer's homebred Hr Ebony Princess smashed the Prairie Meadows 400 yard track record Sunday afternoon with an impressive 3 � length win in the $63,500 Iowa Double Gold Derby. Saltsguninforsucess finished 1-� lengths in front of Runway For Corona who was third. Under jockey Jorge Torres, Hr Ebony Princess had two lengths on the field almost immediately and extended her lead to cover the 400 yards in :19.208 seconds, a 110 speed index. Sooner Country had just set the previous record of :19.445 on Friday (August 30). Saddled to Stacy Charette-Hill, the IVORY JAMES filly earned $25,400 to boost her career total to $71,773. Out of the Opposite Abstract (TB) mare Devilish Princess, Hr Ebony Princess has won four of seven starts, including two derbies this year. Jackie Kirby saddled the super consistent Daltsguninforsucess to a second place finish for owner/breeder Larry Thompson and Don Anthony. The earned $10,795 for the effort. Tony Guymon was aboard. 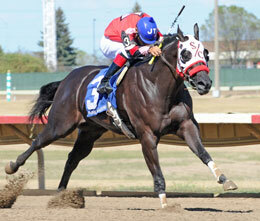 Runaway For Corona races for Ruthardt-Wood Quarter Horses GP. Kasey Willis saddled with Russel Hadley riding. Bred in Oklahoma by MV Parker, Jr., Runaway For Corona picked up $6,350. Completing the course were Vibranz, Sooner Regards, Ivorys Special Lady, Capivant and Huntin Ivory. Freakin Fast and Nomonkeybizness were scratched.